I just picked up my 500 A.D. roman-ish sword. I want to display it, but I don't want it to look like just any sword in a stand, not that any sword is just a sword. I can think of two ways of doing this. 1) An exceptional sword stand, but not one that you see all the time, something unique. maybe two roman standards "SPQR" and an eagle booth on a marble column with the sword in between or something. Has anybody seen a sword stand that stands out from the rest. 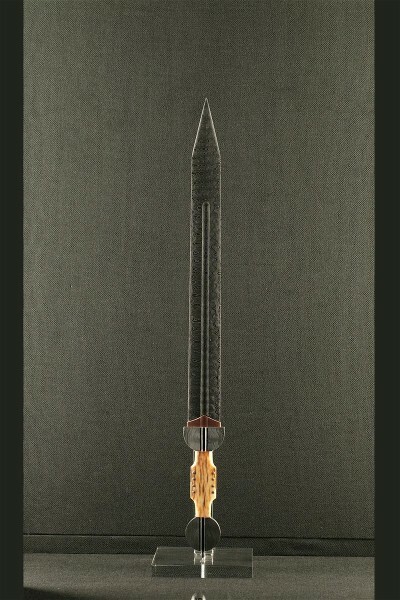 Mabe the sword sitting on two small brass holders with a black background. I don't know what I want to do yet, right know I'm looking for ideas. 2) Maybe the sword should be diplayed with a roman wall relief behind it, or some sort of picture showing roman swords in battle. The bottom line is that I don't know right now, and I'm looking for ideas, so.... what do you have. How about making a sword case or stand out of "padauk"? This is a gorgeous deep red hardwood. Just an idea. Actually I was in the process of making a sword case for my Arms & Armor swords, then I saw a sword rack one of the members has to display his Albions. So I am making the swordcase into a bookshelf and am going to draw up prints to make a sword rack instead of a case. You will have to go to an exotic hardwood specialty store to find padauk, or maybe purpleheart, zebra wood is also gorgeous but very expensive. Just an idea, I was a cabinet maker for 8 years. One thing about padauk though, it is a high energy wood, so if you try to use a router on it, it will probably blow out on you, in other words, instead of a smooth edge from the router bit, you may well get blow outs of wood. I agree with Bob padauk is a gorgeous wood, and one of my favorites. During my time in the oriental arts my sensei made a bo for me out of padauk. I recently used it as a spear shaft on this piece. It had lain under my bed for several years and I'm glad I finally found a use for it. It's a beautiful piece of wood. I'll check into what the wood looks like. Any suggestions or links to sites you've seen that has a different kind of stand other then the tipical straight up wood with arms etc? I like the idea of those Albion PoB stands they sell, simple and beautiful. I bet you could do some spiffy stuff with the same idea. I like the Albion PoB stands, but I wish someone would make a quality vertical free-standing stand for european swords. Something like those single sword stands made for japanese swords would be nice.